Happy to report that both the Board of Governors and the House of Delegates of the Pennsylvania Bar Association have adopted a Report and Recommendation I helped to write along with Jonathan Koltash, Esq., and Jennifer Menichini, Esq. 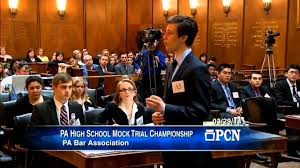 with regards to a request to the Pennsylvania Supreme Court to issue a new rule allowing attorneys to earn up to 2 CLE credits a year, and judges up to 2 CJE credits a year, for their participation in the annual Mock Trial Competition. With this adoption of the Report and Recommendation, it is now the official position of the Pennsylvania Bar Association to submit a request - on behalf of all Pennsylvania lawyers - that the Pennsylvania Supreme Court change the Rules of Continuing Education to allow for two CLE and two CJE credits for mock trial participation. It is quite an accomplishment to get this far. We now wait and see if the Pennsylvania Supreme Court will grant this request. The overriding hope is that, if this is granted, more attorneys will assist with helping out the Mock Trial program as Attorney Advisors or Jurors if they know that they are going to get credits for it. In the end, high school students from all across the Commonwealth of Pennsylvania will benefit from this greater participation by local members of the bar.